Australia finished Day 1 of the third and final Test at Perth at 339 for 3. Openers Shane Watson and Simon Katich set the hosts on course to a big score with a century opening stand. Both the openers fell short of their centuries and in particular Katich was very unlucky to miss it by one run! Watson cracked 89 with 15 fours in 130 balls and Katich’s 99 came with 10 fours in 177 balls. Australia got a big jolt when Skipper Ricky Ponting who bats without an arm guard got hit by a 146 kmph bouncer from Kemar Roach. Ponting after batting for a while retired hurt at a score of 23. 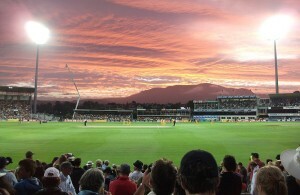 Michael Hussey controlled the rest of the day’s play with an unbeaten 81. The Aussies have given Test Debut to Victorian fast medium bowler Clint McKay who replaced the injured Peter Siddle. For West Indies, tall fast bowler Gavin Tonge is making his Test Debut after replacing Darren Sammy. West Indies made two more changes, one was a forced one with Narsingh Deonarine replacing the injured Chanderpaul. The other change was Adrian Barath getting dropped in favour of Travis Dowlin.